DC keeps revealing more and more of the Convergence event months as they move their show from the East Coast to the West. I guess we will know all of these titles well ahead of the game. This whole thing really seems to be DC's attempt at having their cake and eating it too. They can applaud themselves for rebooting everything with the New 52, saying it needed to happen. And then they can call back to the prior universes for a money grab. http://www.newsarama.com/22819-dcs-convergence-week-three.html It includes things like Len Wein on Swamp Thing and Marv Wolman on Teen Titans. Those are truly looking back at DC history with fondness. Here are the super-titles and one other that grabbed me. The released art is above. I don't mind seeing the pre-Crisis headband Supergirl again. Once more we will see how it is Supergirl's destiny to die in the Crisis. I wonder if in this story, Supergirl will willingly go to her death, like a hero. Still, I am sort of sick of DC picking over the bones of this story. And I am especially sick of Wolfman going back to this moment. He has already done it here. I worry whenever Wolfman writes Supergirl. The art looks very nice though. It has been a while since we saw Superboy and the Legion. This looks like the early Levitz/Giffen time period fiven the costumes I am seeing. Again, the art looks interesting here. So there are a couple of things about this solicit that made me want to promote it. I have a small warm place in my heart for the white-jumpsuit Diana. I wish I could explain it. 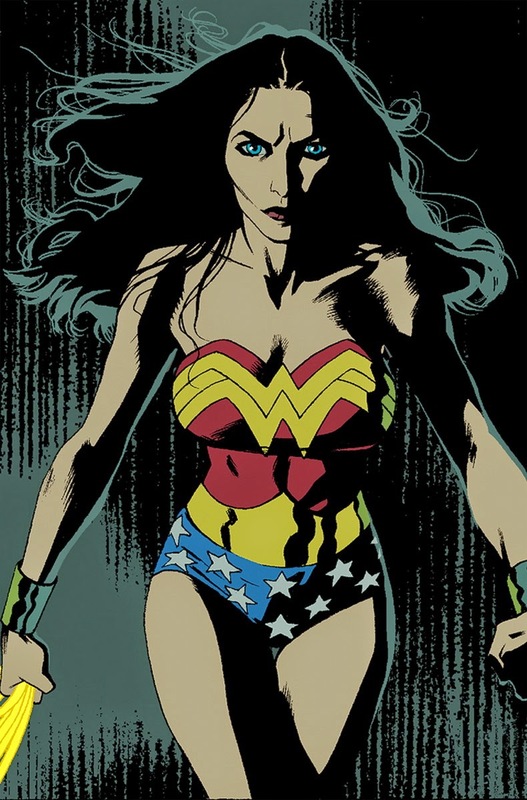 While I don't know what to expect from Larry Hama writing Diana, I do love Josh Middleton's art. Remember, he did Supergirl covers for a while, right at the beginning of the Gates/Igle era. I am happy I'll see his work on interiors! This whole thing could be a disaster. But I'll be sampling a handful of these books. 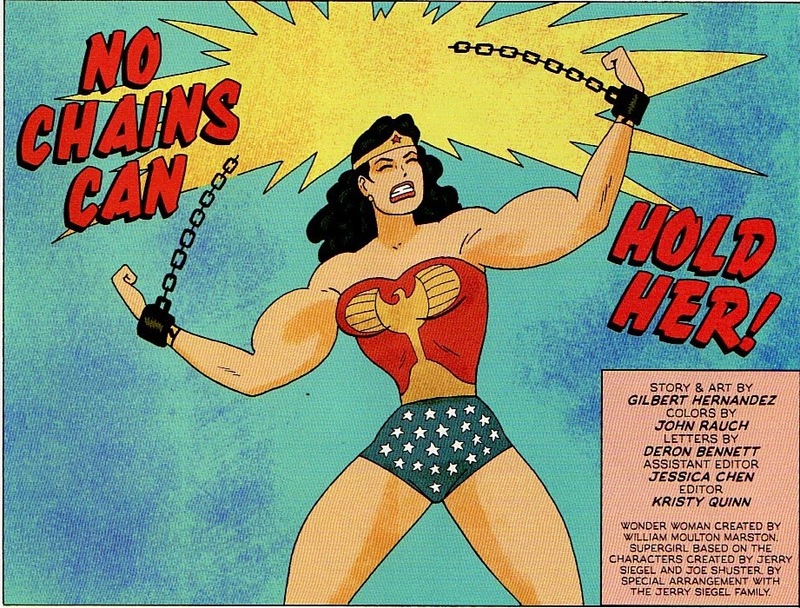 Earlier this week, I reviewed the first part of 'No Chains Can Hold Her', the Wonder Woman story by Gilbert Hernandez that ran through Sensation Comics #4. I will cover the second part here. 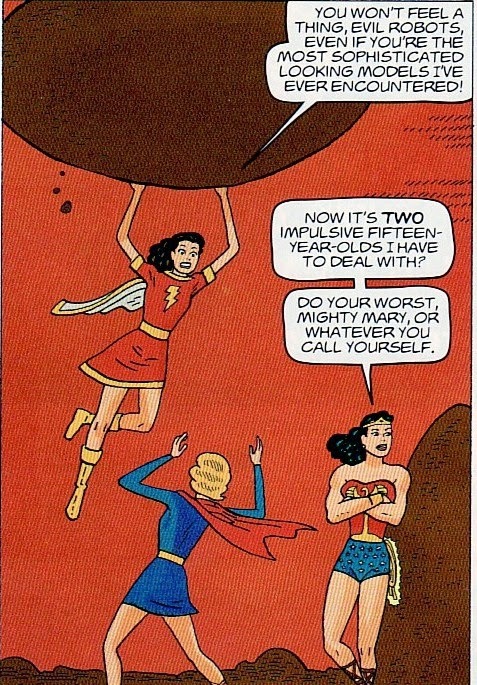 As I said before, this is really a Silver Age story, with a classic Supergirl, and in this part a classic Mary Marvel co-star with Wonder Woman. Unfortunately, for the bulk of this story, Diana is under the control of Kanjar Ro and fighting the younger heroes. 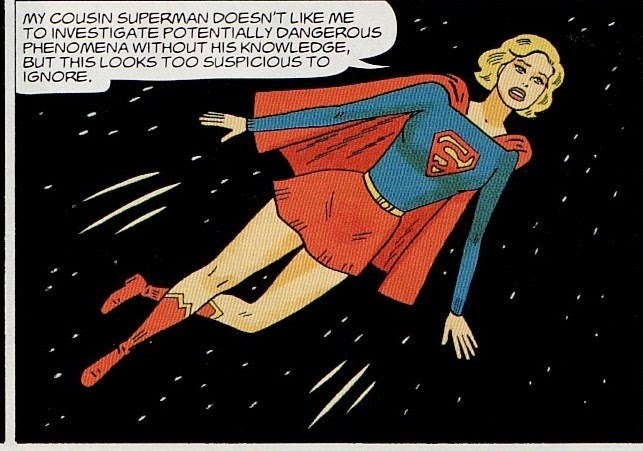 Since Supergirl shines, and since it is a great homage to the Silver Age, and since the art is mesmerizing in its simplistic beauty, I love this story. That said, I do wonder what Diana fans feel about this given she is in the background of her own book's story. Remember, Wonder Woman is hypnotized by Kanjar Ro. And Supergirl has followed along to help. I love that the colorist got the skirt color right in this issue. Supergirl should be pure Silver Age here, in the blue skirt! I love Supergirl's opening statement, relaying she is as strong as Superman. And having Kanjar Ro call her an adolescent pest is great! Despite her youth, Supergirl is mature ... and noted to be so by Diana. Supergirl knows that this fight is only for the leering enjoyment of Sayyar and Kanjar Ro. In fact, the smiling faces of the villains confirm it. Ro even says that fight of two women is for their entertainment. Creepy. This is a silver age story and it has some DC cosmic in it. So I was thrilled ... THRILLED ... that we got this one-panel guest, Hyathis! I am a big Hyathis fan! And even she is feeling the reverberations of the Diana/Kara fight. Things get even wilder when Kanjar Ro uses his technology to bring Mary Marvel into the battle from her home world ... presumably Earth S! Remember this is the Silver Age. Mary immediately thinks this is some plot and Supergirl and Wonder Woman are evil robots. Just like that it's a brawl. 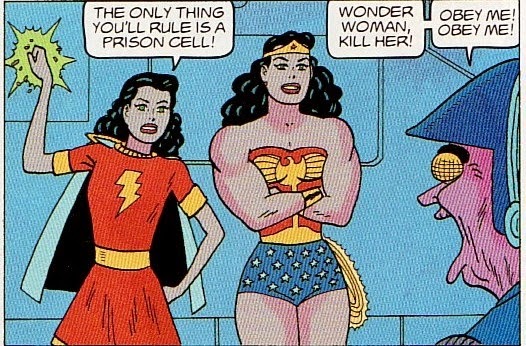 I love Wonder Woman's indignation over dealing with 2 super-powered 15 year olds. So much is conveyed by the look away, the crossed arms, the flat expression! Wonderful. 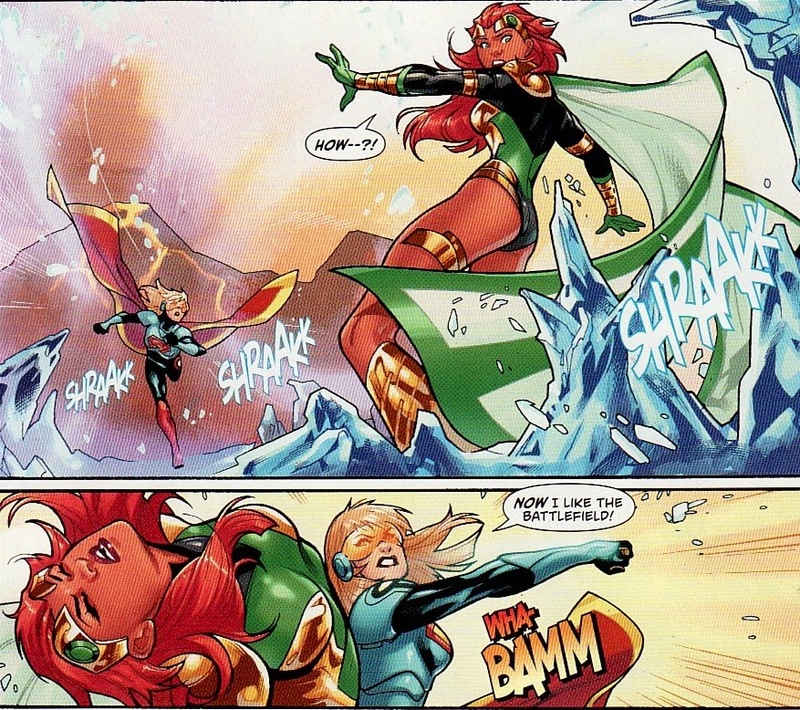 In the most hysterical sequence, Mary and Diana use Kara as a weapon, battering each other with the Maid of Might. That is crazy funny. There was something almost Tintin-esque in the art here. But how can you not chuckle looking at this sequence. 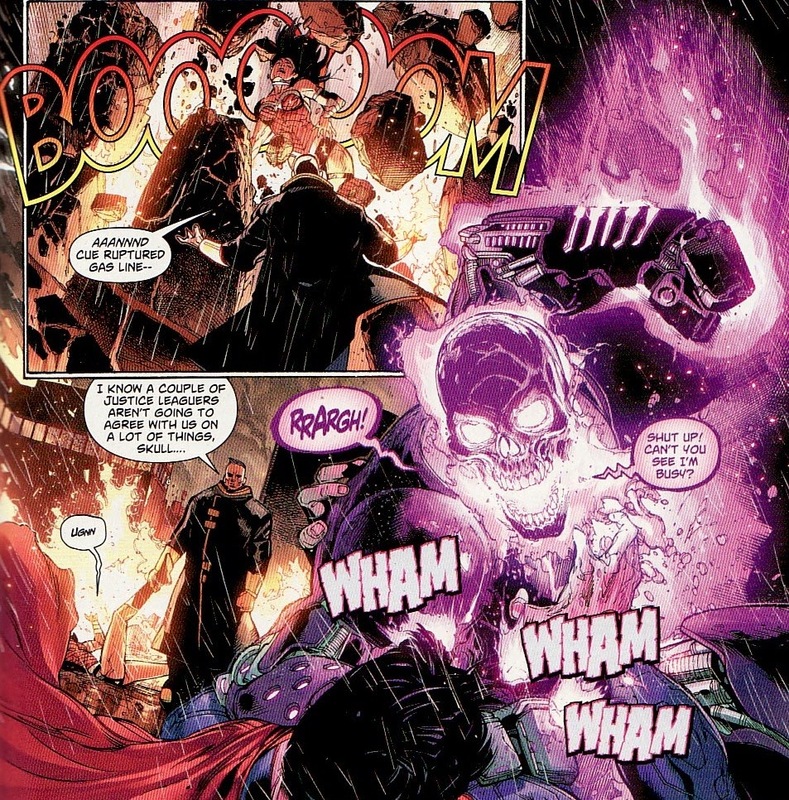 After being humiliated, used as a range weapon, Supergirl blasts both of the other heroes with her heat vision, incapacitating them, and allowing her to confront Kanjar Ro. Look at that expression on her face. Exasperated! Seriously, Ro has lots of tricks. He has a Kryptonite beam in his ship which floors Supergirl. 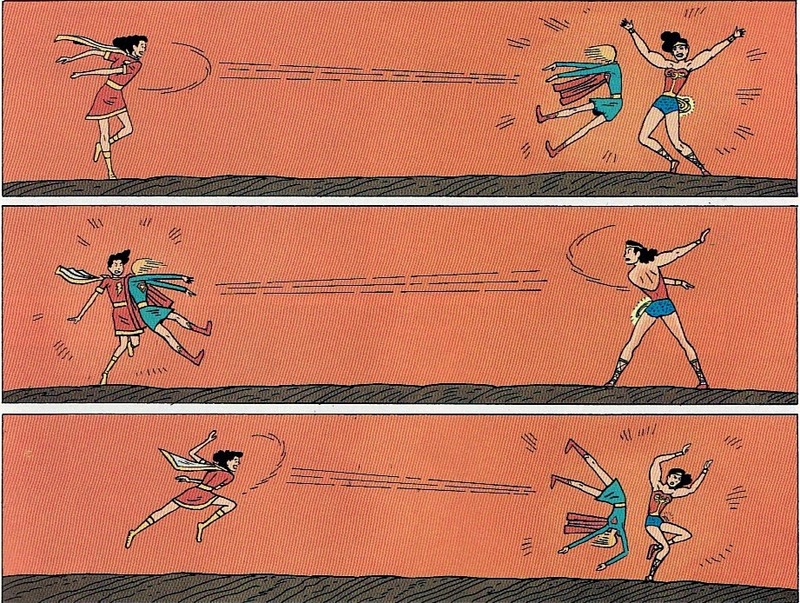 Luckily, Mary Marvel and Wonder Woman recover and head to the ship. 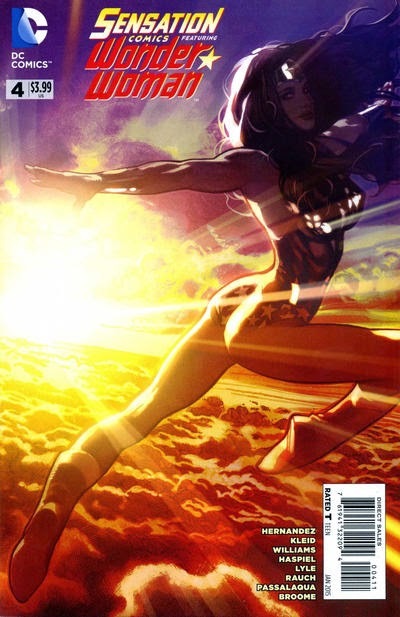 Wonder Woman is even free of the hypno-ray effects; they were burned away by the heat vision. I love the contrast in figures between Mary and Diana. Mary has to streak Supergirl to a nearby sun to revive her. Kanjar Ron doesn't think they will survive. But of course they do! After the brief skirmish, all the heroes are smiling. I even like Kara and Mary holding hands. And one leg behind the other, daintily, almost like a curtsy, is perfect for these young women. There is that sweetness of the 50's in this story. I do think it is telling that Kanjar Ro says that Supergirl and Mary Marvel did the 'heavy lifting'. It is true, the younger heroes were the dynamic characters for most of this story. The only way to get everyone back where they need to be is to have the three heroes fly into each other at top speed, the resulting energy flinging Mary back home. We even get a peek at Earth S and the Marvel family. And Wonder Woman and Supergirl head back home. I absolutely love that last panel. Wonder Woman with a big smile, talking about having a girls' night out. There is a silliness to this story, akin to many Silver Age stories. But for me, it read nostalgic not anachronistic. How great was it to read a sweet Supergirl trying to do the right thing. Or a Mary Marvel who fights for what's right? And the art is perfect for the piece. These tend to be dark times in comics with futures ending in both of the big two. I'll take a moment of insanity as a break from the dour anytime! 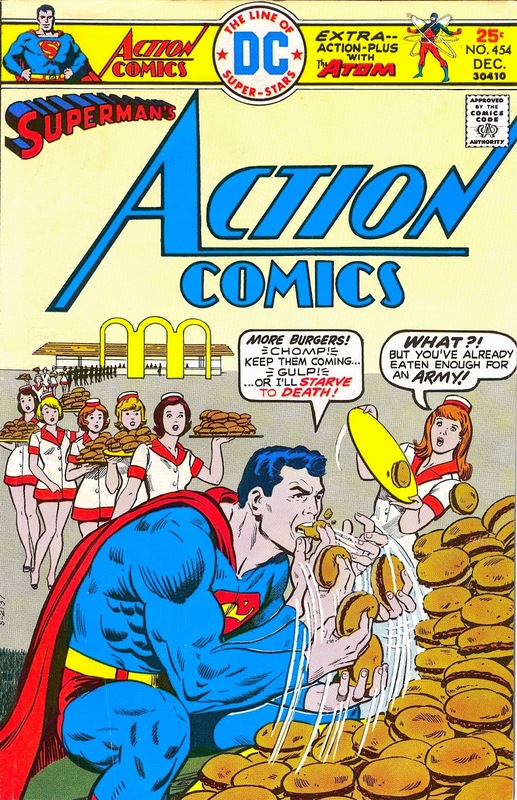 I will be busy stuffing myself much like Superman is above (albeit with turkey and sides not hamburgers).Ahh, the tradition of gluttony! Anyways, I am sort of taking today off. Just wanted to say thanks to everyone who visits, talks Supergirl and Superman with me, and is part of the community! For those who come here, they will know I loved the Superman related digital-first titles: Smallville and Adventures of Superman. Adventures of Superman was a classic anthology, different teams, tenor, art styles. 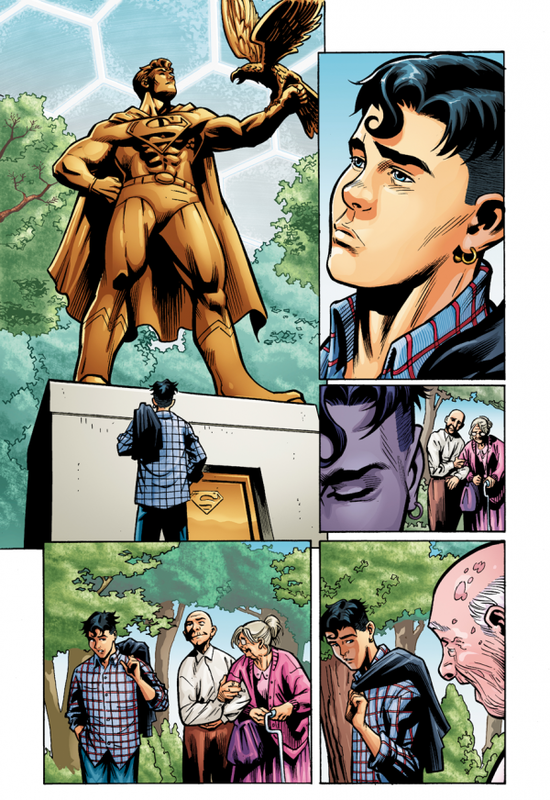 The best stories in that book seemed to revolve around Superman being an inspiration. It was like reading about the big picture of who Superman is in theory. I loved it. So far, Sensation Comics has read much more like a true anthology series. There are wildly different feels to the stories I have read here so far. And that has made this an interesting book for me. Some stories are inspirational. Some are humorous. Some are straightforward action. One story, which ran partly in Sensation Comics #3 and finished in Sensation Comics #4 is worth reviewing here because it is very Silver Age, with classic Silver Age villains and a Silver Age Supergirl. It also is done by comic legend Gilbert Hernandez. 'No Chains Can Hold Her!' is written and drawn by Hernandez and his style of art. I do wonder how Diana fans reacted to this story because Wonder Woman is more a victim in this story. Indeed, Supergirl could be considered the hero of the tale. 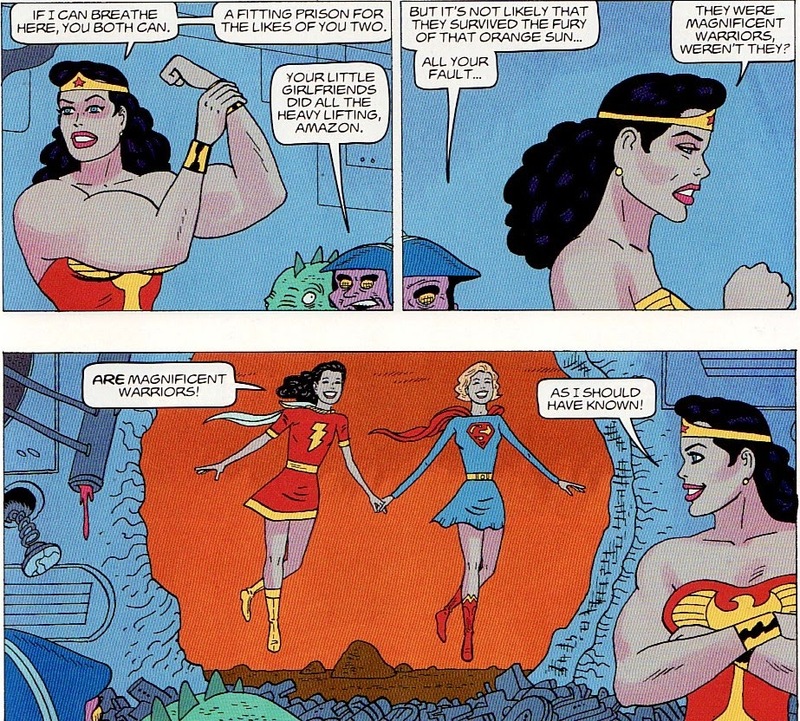 But I love just how big and powerful Hernandez portrays Wonder Woman. She is huge and muscular! No big surprise that no chains can hold her! The style is simplistic. But it oddly beautiful. The plot is relatively simple to start. 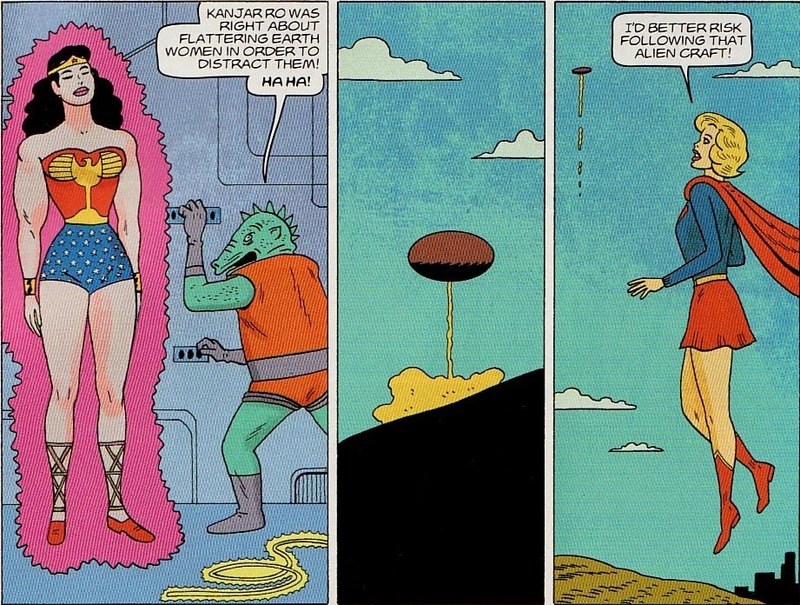 Wonder Woman investigates a spaceship that has landed. Initially she is chained by robots. Hernandez refutes the old lie that being chained by a male depowers Diana. Robots aren't men. But regardless, it doesn't work. And nothing like 'lasers and bracelets'. It turns out that Sayyar, the lizard emperor of planet Llaarr is working with his enemy Kanjar Ro to take over the galaxy. Somehow, Kanjar Ro has a hypnosis ray which will only work on Earth born. He wants Diana to be his zombie slave and warrior. Now Sayyar calls Diana an invincible warrior, a symbol of courage and strength. And his flattery distracts her so much that she is captured in that hypno-ray, rendering her powerless and enslaved. That seems weird, for Diana to be so taken by the words to lose focus. And to have the hero defeated in her own book?? But look who is watching! Supergirl. A red-skirted Supergirl! So she should really be a blue-skirted Supergirl because she is pure Silver Age here. Luckily, that color error is fixed in Sensation #4. But read that word balloon. Superman not wanting her to investigate things, wanting her to stay hidden. That is pure 'stay in the orphanage until you know how to control your powers' is pure early Action. I do love how Hernandez has her defy him, knowing the right thing to do. Those crossed legs, almost shy and coy, evokes that feeling too. 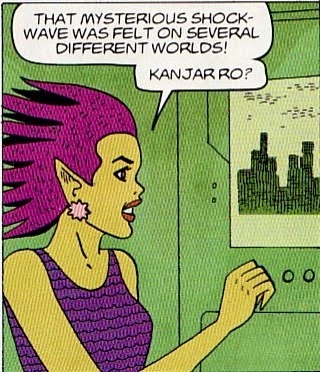 At last we have the ship land and meet old JLA villain Kanjar Ro who is in complete control of Diana. An 'easy Earth girl'? Luckily Supergirl is there and ready to rescue Wonder Woman. Does that make this a Supergirl story? What about you? Any Wonder Woman fans want to comment?? Anyways, I have liked Tomasi's writing in the past. And I really love Mahnke's visuals. So I was a bit optimistic about this new team. Would they be able to make this relationship feel real? Would they elevate the book out of the cellar? There are some good things about the issue, no doubt. Superman is written like Superman should be written. Indeed, he has the best moments. And, no surprise, Mahnke's art is fantastic - detailed, expressive, and stylish. I applaud that Tomasi devotes a large portion of the book to the romance, showing Superman and Wonder Woman trying to enjoy each other's company and a quiet date night. But like Soule, there isn't much here to show why these two love each other, why they are together. And while Superman is written well, Diana suffers a bit in this issue. She seems to vacillate between extremes and that just doesn't feel natural. Tomasi starts out by giving us a flashback of the first meeting between the two heroes, back when Darkseid tried to invade and the Justice League formed to repel him. This scene seems to be there to contrast the characters. Superman is all noble here. 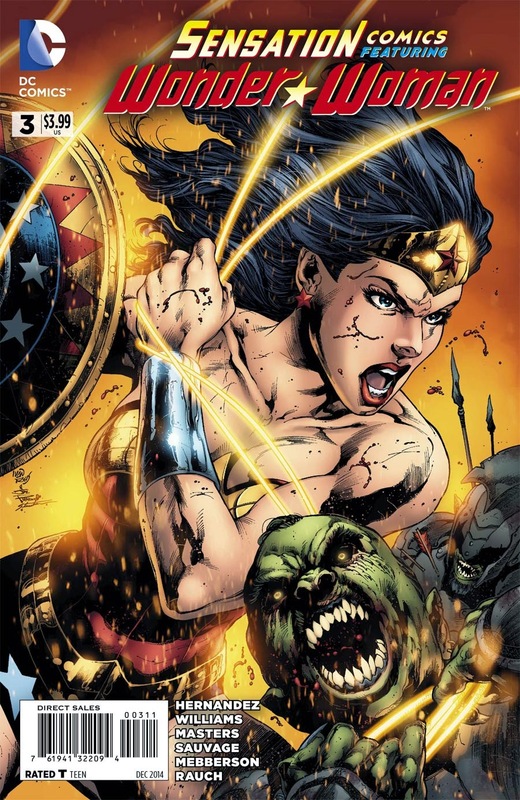 Wonder Woman is all blood and guts warrior. So we start by seeing Superman trying to construct some sort of wall to keep parademons away from civilians. He tells Wonder Woman he was 'trained' in combat by his father. She tells him he is thinking about too much on the battlefield, that a wall won't protect anyone, and that he should be fighting more. 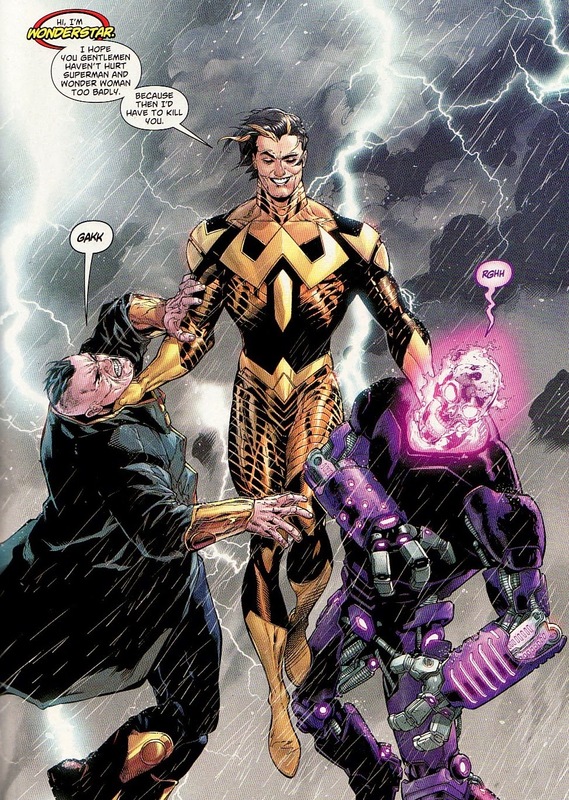 It is a problem in the New 52 DCU. The warrior aspect of Diana is all we see these days. There is no ambassador of peace in her at all. And not protecting people? Seems off. Here she sounds almost Spartan. Not strong? You would be culled from her culture. And why should she bother protecting us? Superman has to chastise her. He considers himself one of us and he doesn't want her around. And she knows he isn't 'one of them' and seems surprised he would want to be associated with humanity. For me, this is horrible characterization of Diana. Then she is all smiles, trying to glad hand Superman. Until he yells at her that she can't simply stand around and let people die. It silences her initially. Then she denies his allegation that she would let innocents die. Again, this is pretty terrible for Diana. And having them meet like this, having Superman put in such an obvious position of moral high ground seems like a rough foundation for a relationship. We flash forward to now. It is date night, but Clark is stopping them from getting out the door because he is busy writing an article, a human interest story about one of the families affected by Doomed. I empathized with this panel. I have called myself far worse things than pinhead as I try to get my thoughts down. As for Diana, she can't understand why he can't write the article at super-speed (his writing doesn't work that way). Nor does she understand why Clark is writing these stories. All this does is further cement her not understanding Clark. Why would she be with him? And why would he want to be with her if she doesn't understand everything he does? But then things get a little weird for me. That first panel looks like something out of the Stepford Wives. "Does typing make you happy Clark? Then I am happy. Are we late for our date? I am still happy." Maybe if I got the relationship, this would feel more loving than lobotomy. Meanwhile, Major Disaster and Atomic Skull are about to attack a nuclear power plant. But they are doing it based on orders they have been given. So there is a bigger bad than these guys. Date night, on the other side of town, isn't going too well. Again, Tomasi shows us what a good guy Clark is, as he keeps giving their taxi away to other people. As a result of not having a cab, they'll be late for the show. 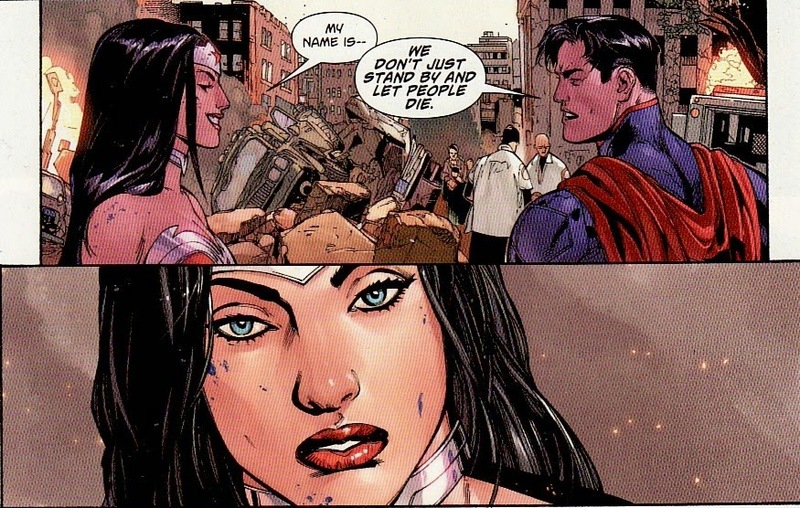 This irks Diana leading to the 'crossed arms, icy stare' panel above. Where is the 'if it makes you happy, I'm happy' Diana from a couple of pages ago (not that I liked that). Instead we have a 'stop annoying me Clark with your country manners' Diana. I don't like either. But to have them both in one issue seems extreme. Tomasi has a handle on Clark. But I don't think he has a feel for Diana ... at least not yet. Before they can get into a cab, they see a purple explosion in the direction of the power plant. I really liked this panel from Mahnke. The point of view. The use of shadow. Nice stuff. The two heroes head to the power plant and battle the villains. 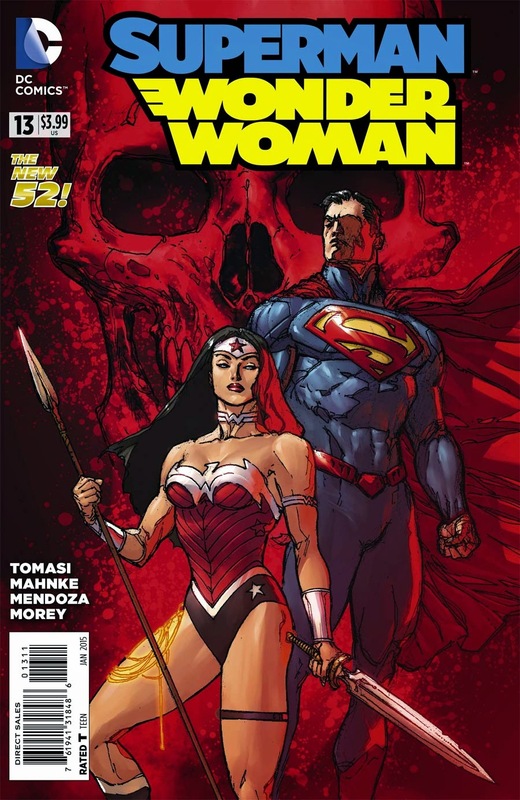 We are talking about Wonder Woman and Superman fighting Major Disaster and the Atomic Skull. Somehow, not only is this a fight, it is one the villains win! Wonder Woman is taken out by enormous hail and a gas main explosion? Again, the art is just fantastic. But this seemed like a fight that shouldn't have been so one-sided with the villains having the upper hand. But as Disaster and the Skull try to leave the scene, they are stopped, easily defeated by this newcomer Wonderstar. So this new creative team picked up the vibe I got had with the old team. I still don't understand why these two are together as a couple. I still don't feel it. These scenes showing how much they love each other come off a little stilted and awkward. Wonder Woman is really all over the map in this issue. There was very little of her that felt right. All that said, Superman is written great. This Superman sounds like Classic Clark. And the art is just fantastic. Like Daniel before him, Mahnke's art might keep this book on my pull list longer than it would otherwise. I'll probably read this first arc and give Tomasi some time to get his feet under him. But then .... we'll have to see. 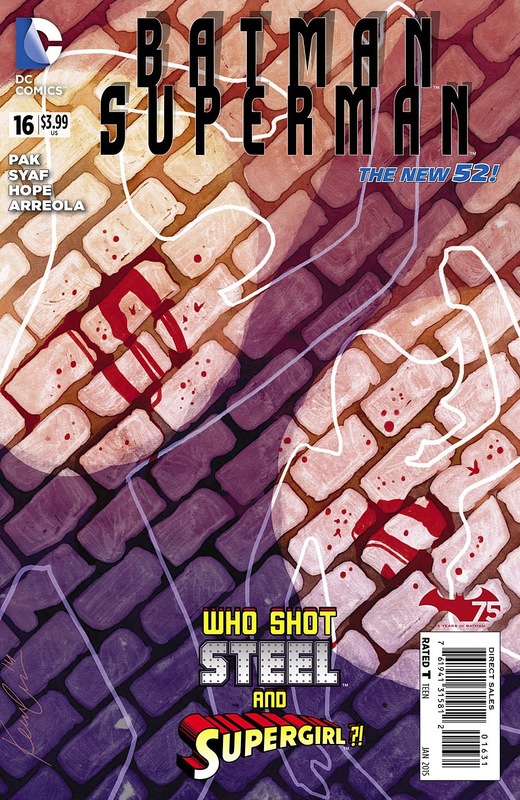 Batman/Superman #16 came out last week, the first issue post-Doomed. But it is hard for me to actually place it in any sort of particular time. This is a clean-shaven Superman and one who is actually active and happy to be active. This isn't the bearded glum Superman debating being a hero in Action Comics even though both are written by Greg Pak. The concept of the story is a solid one and plays well in the context of a (gasp) happy Superman. Just as things start to look up, someone begins targeting Superman's loved ones. Just like that, Superman has a Joker-equivalent in his rogue's gallery. And as a result Superman needs Batman's help. It is a great contrast ... Superman's happiness and his knowing a psychotically obsessed murderer trying to kill off your friends? It also sets up one of the more established themes of this book, to contrast Superman from Batman. Adrian Syaf replaces Jae Lee as the artist on the book. I will admit to missing Lee's work. But Syaf channels Eddy Barrows a bit and puts in a couple of very solid artistic moments including a powerful splash page for Batman. He'll work well on this book. 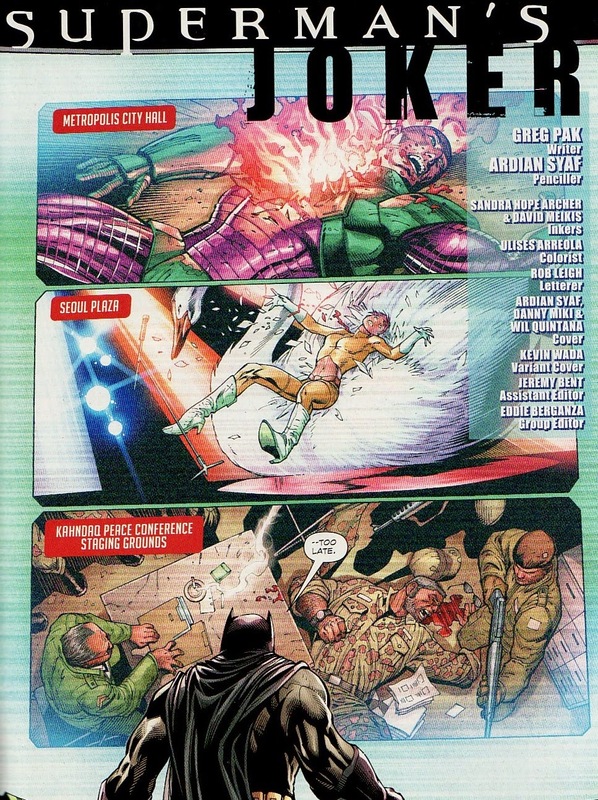 The opening pages of the issue present a sunnier world than I am used to seeing in the New 52. First we meet a couple of men who are dressing up as Superman and Batman to cheer up some kids in a hospital. It is had to imagine kids liking the heroes in the New 52 where they are generally distrusted and targeted by our military. And then we see the extended Super-family helping bring some beached whales out to the deep ocean. Look! 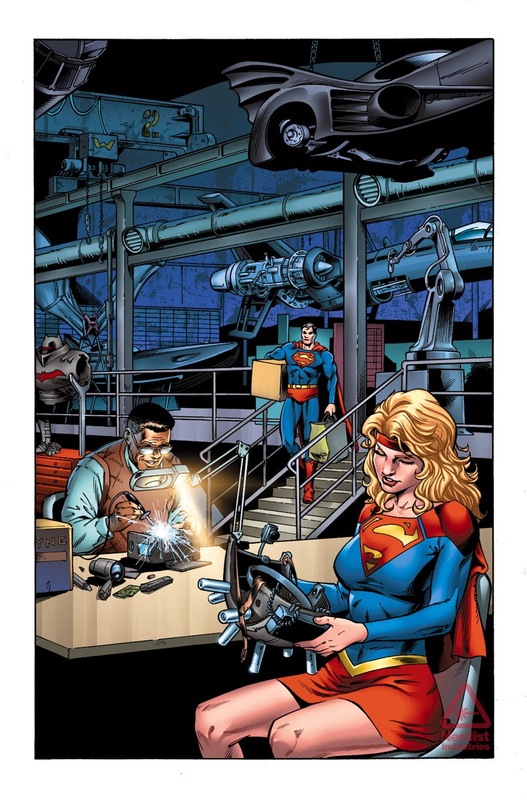 Superman doing a random good deed with Supergirl, Krypton, AND Steel! No anger or angst. Just doing something good. And nearly as unbelievable, people are on the boats and shore cheering! It is sort of sad that a positive image of heroes working together is so rare these days. In the New 52, Superman is 'just not used to happy endings'. Unfortunately, this is the New 52. The 'happy ending' is brief. A whale is killed. The hospital volunteer in the Superman costume is shot in the chest. And the super-family is shot! I guess there can be no happiness in this DCnU. Shockingly, the heroes are relatively unharmed. So this isn't as big a deal as the cover or solicits made it out to be. Could this just be a way to let Superman know that this assassin is out there. However the man volunteering in the hospital is dead. It is alarming to Superman that all this is happening. At the autopsy he learns that it is unclear how the wound happened. 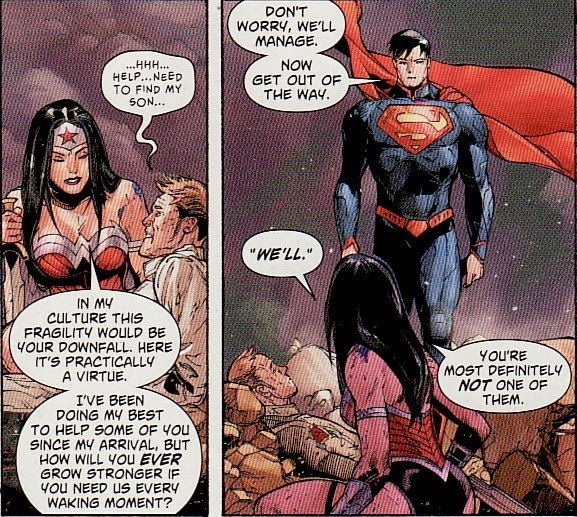 This is an interesting exchange between Lois and Clark as she basically calls out both aspects of Clark/Superman as falling below her expectations. She thinks Superman should be out hunting who killed this man. He isn't. He is right there. And she thinks Clark should be out running down the story. This Lois is challenging. And Clark picks up the challenge. This is a murder mystery. He needs the world's greatest detective. So it is off to the hospital to check out the murder scene. Now why the hospital would let kids play within feet of the bloody crime scene is beyond me. But they do. The initial scan doesn't turn anything up but one of the patients was an eye witness and saw that it wasn't a bullet but some type of superfast drone that killed the guy. 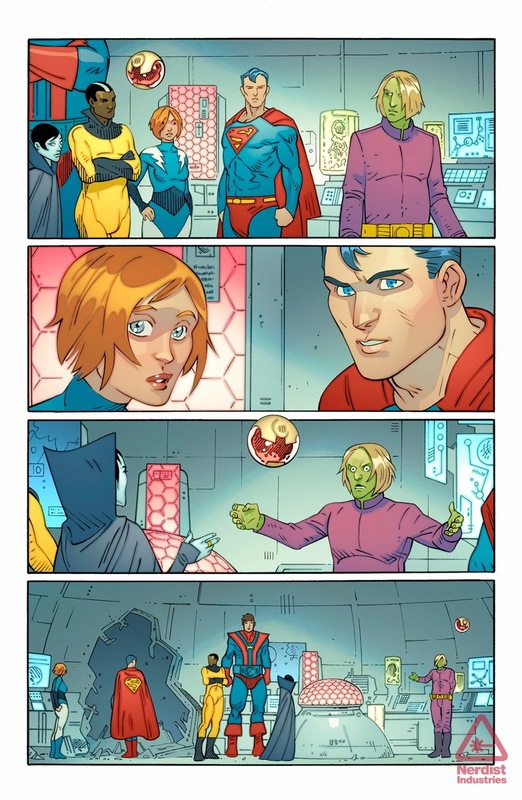 What I did like was how easily Superman slips into 'nice guy' mode, juggling and cheering up the kids. Batman tries to put it all together. 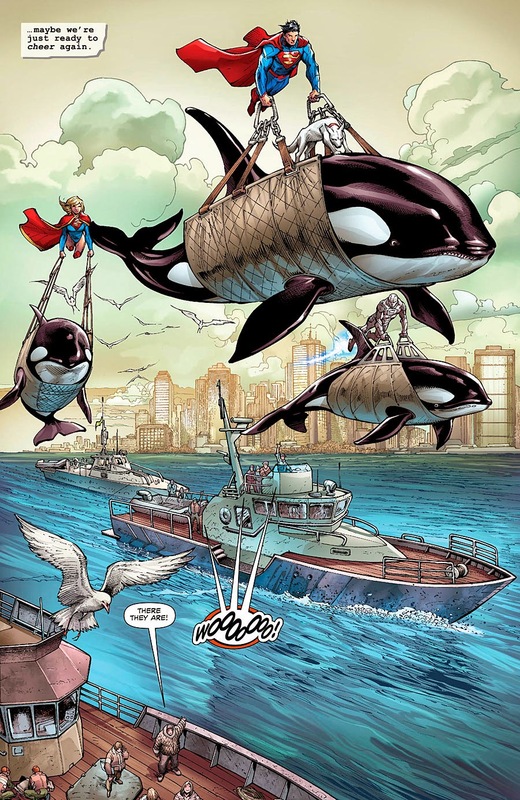 Killing the whale, targeting the family, killing the man dressed as Superman. It shows an unnatural obsession ... akin to the way the Joker is obsessed with Batman. Unfortunately it is a Joker with big technology. Who is Superman's Joker? I don't have a guess ... yet. And then we get a very strong page from Syaf where Batman admits that he hasn't won every battle with the Joker. 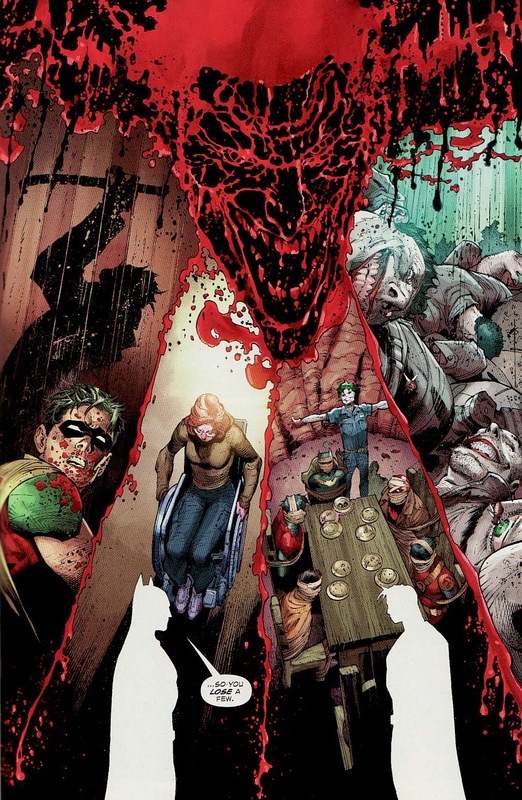 There is a blood stain in the form of the Joker's face. And then we see the failures - Jason being killed, Barbara being paralyzed, the Death of the Family, and the piles of bodies of those killed. 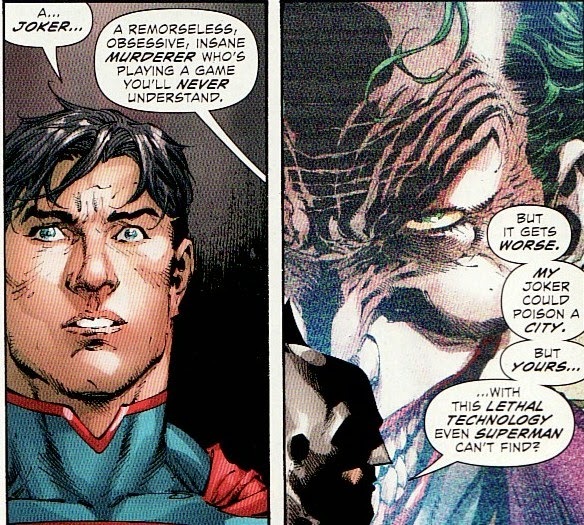 Superman asks Batman if he ever thinks of killing the Joker and Batman says yes. Again we see that contrast of the heroes. Superman is wide-eyed, almost scared about who his friend is. And about his desire to never become like Bruce. And Bruce is almost smiling, agreeing he doesn't want a Superman to be dark. The split face panel composition is a well-worn use of panels. But I liked this one as the faces are so starkly different that this trick works well. But the mystery deepens. The Bat-computer is hacked and whoever 'Superman's Joker' is, he feeds active video of attack on Lex ... and then two other people. Anyone recognize the pop star? Or the military figure? I thought this was a good issue and a nice beginning to a new arc. This is an issue of opposites playing off each other. The good feelings of the opening sequence is foiled by the stark images of death and murder. 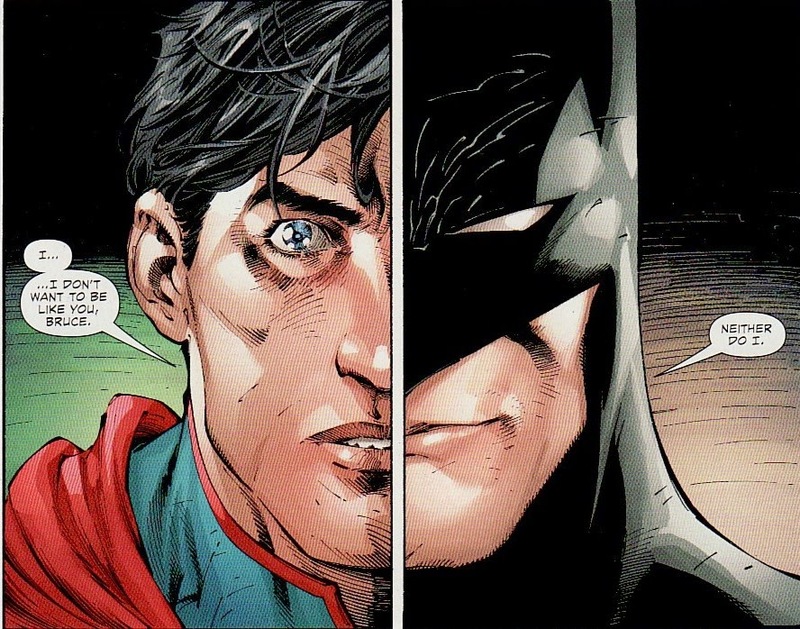 The bright light of Superman is contrasted by the darker thoughts of Batman. Now maybe this is a little forced. It is interesting that the first time I can remember seeing such optimism and old-school heroics like the opening scenes is in the issue where we want to go into reverse suddenly. And I still don't think Batman would ever be a killer given his origins. It is all wrapped around the mystery of who is obsessing over Superman? And who knows Superman so well to attack those closest to him? Or get under his skin? Who has the capability to be tracking a non-entity like the guy in the hospital who was killed simply for wearing the S-shield? Let the guesses begin. Adrian Syaf's stuff is very solid here and I welcome him to the book. We just learned about the February solicits for DC but the real news came about Convergence, the two-month rest period of the DCU while the company moves from the East Coast to the West. 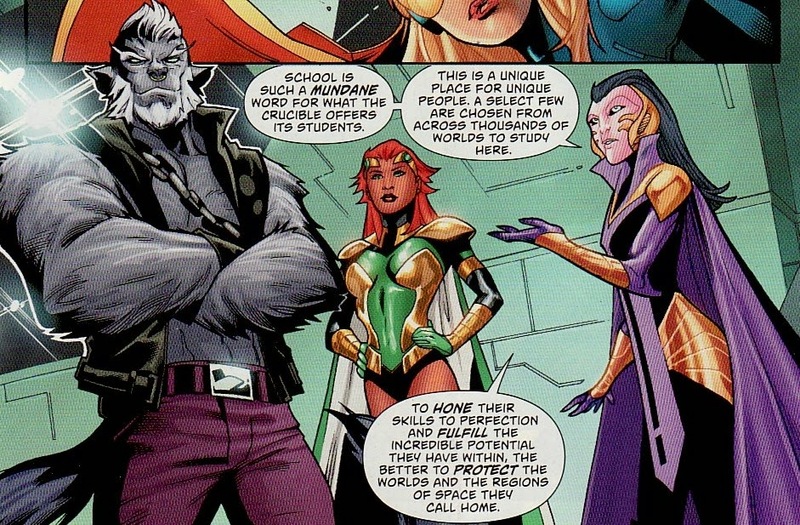 These books aren't in current continuity and merge prior continuities into wild team-up stories. Like most, I thought this was something of an odd idea for DC. They can't keep the regular titles on track? And here are the ones that caught my eye. 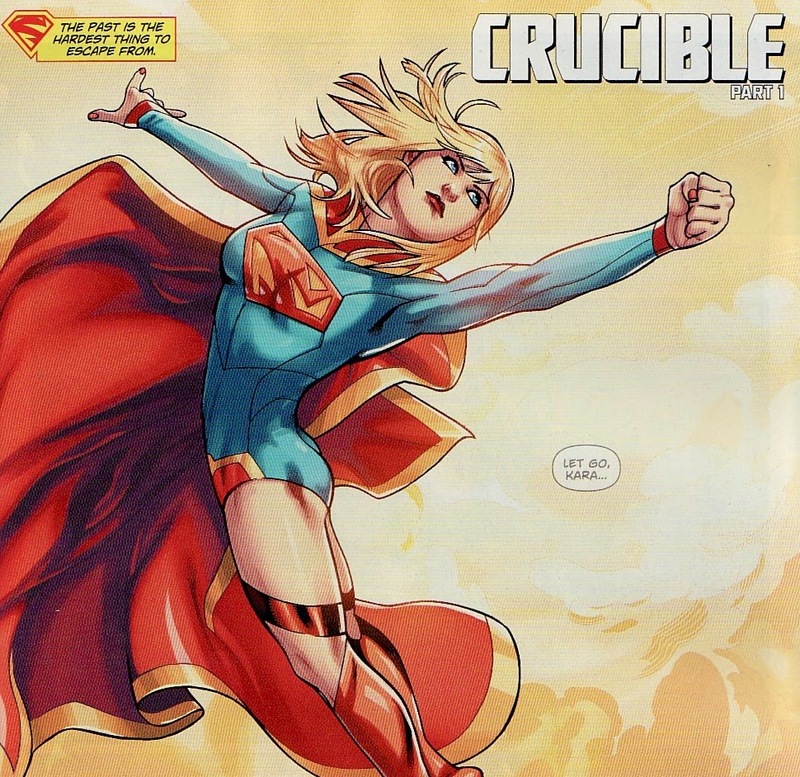 So many people know that I like the Matrix Supergirl, especially in the post 'Death of Superman' years. In that story, she kind of found herself and became a hero. And then Peter David's wild run happened and things were great. 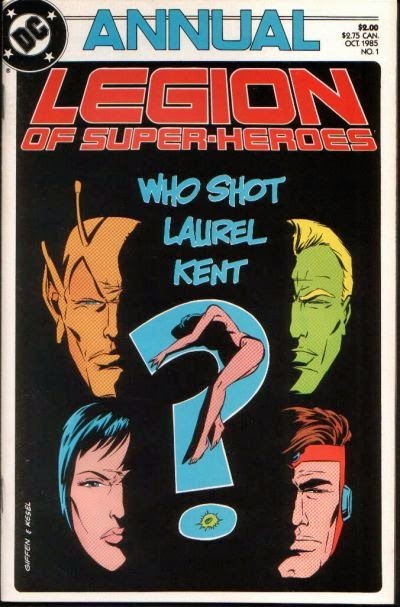 I wonder just where in her personal timeline writer Keith Giffen is going to place this crazy story. I will admit to being a little worried. The simple fact that Ambush Bug is in the book means this is going to be a humor book or a parody. 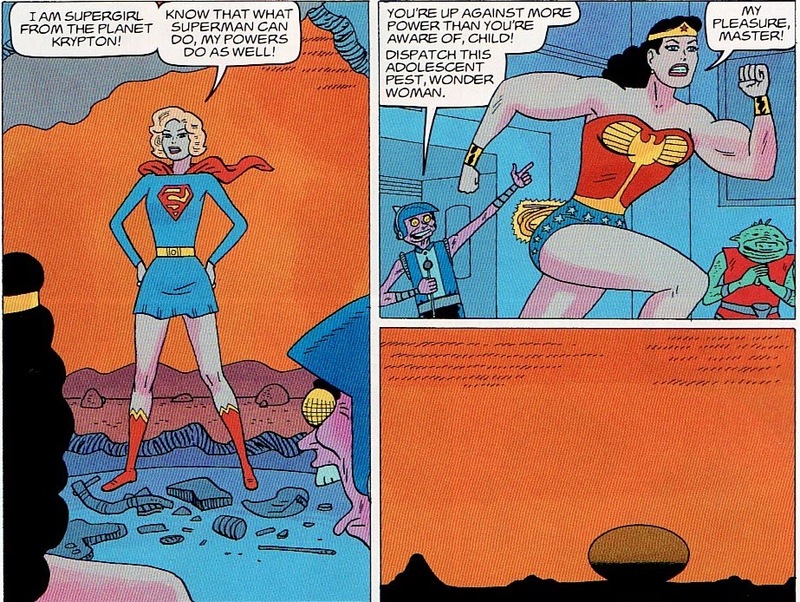 And I don't know Giffen's thoughts on any Supergirl ... but my gut tells me he doesn't like her. I hope the tone of this book isn't one bent on ridiculing her. I do like Ramon Bachs art! 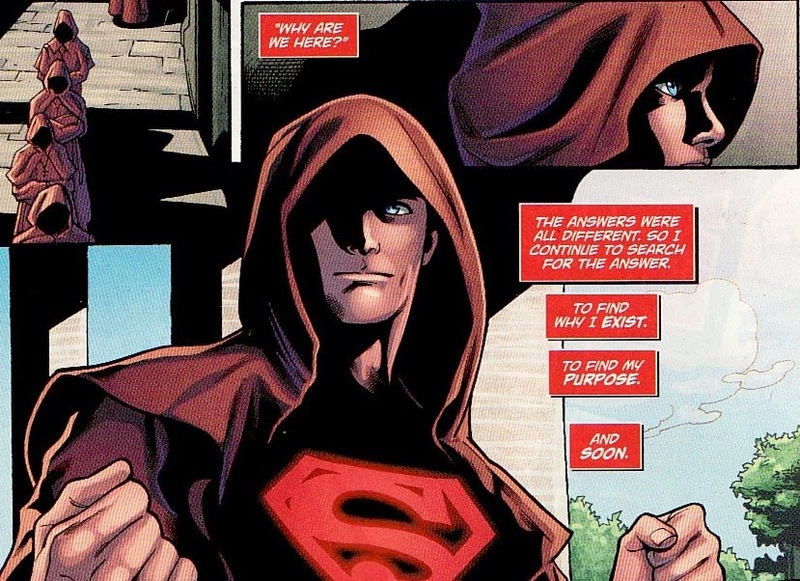 It will be nice to see the old Superboy again. Like the old Supergirl, his character also grew a lot over the years. But fighting the Kingdom Come Superman? Where the heck did that come from? And then, the solicit that most excited me. I guess you can go home again. It is good to see Louise Simonson writing Steel one more time. Add to that June Brigman art and this looks like the book that I am banking on being excellent. Still ... did this whole thing need to happen? Let's see ... over three years, Supergirl has had the following writers. First Michael Green and Mike Johnson. Then Scott Lobdell, Justin Jordan, and Nelson. Over that time, this book and the New 52 Supergirl has had her ups and down. There were times in the first two years ... a time when she was 'angry, disaffected, a loner' ... a time when she was 'Hell on Wheels, as likely to fight her friends as her enemies', someone with no love of Earth ... that a glimmer of heroism shone through. Then H'el on Earth made her bitter and willing to sacrifice billions of people to get home a story where she fell in love too soon and was dupe. Then she was actually killed and disintegrated by her father. 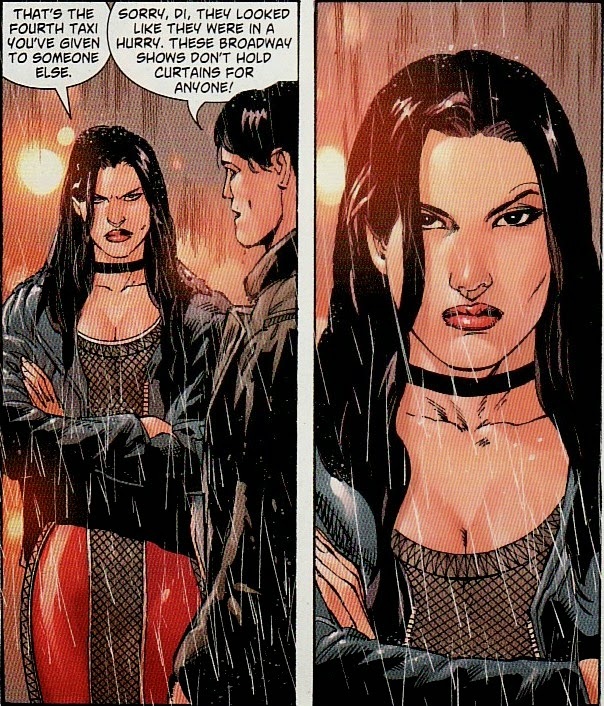 And then she reverted to being chilly and angry in Krypton Returns. And then, in the biggest shock, she was made a Red Lantern of rage and had her character actually rehabilitated and redeemed by Charles Soule and Tony Bedard. I give all of this primer on the DCnU Supergirl to show just how tumultuous the life of our poor Kara has been. And here we begin yet another 'bold new direction' under the writing of K. Perkins and Mike Johnson. When first announced, I was dismayed that things were changing yet again, especially when Tony Bedard had actually made Supergirl a likable hero once more, bringing her closer to the 'classic' Supergirl, a hero looking to help and learning on the way. How could DC derail this title yet again?? Then I began reading the publicity, listening to interviews, and hearing the plans the new writers had. And things seemed better. It felt like both Perkins and Johnson understood who Supergirl was. They were building on what came before, not blowing things up yet again. And there wasn't a mention of 'angry' or 'loner' or 'bitter' or 'Hell on Wheels'. Suddenly, I was optimistic! 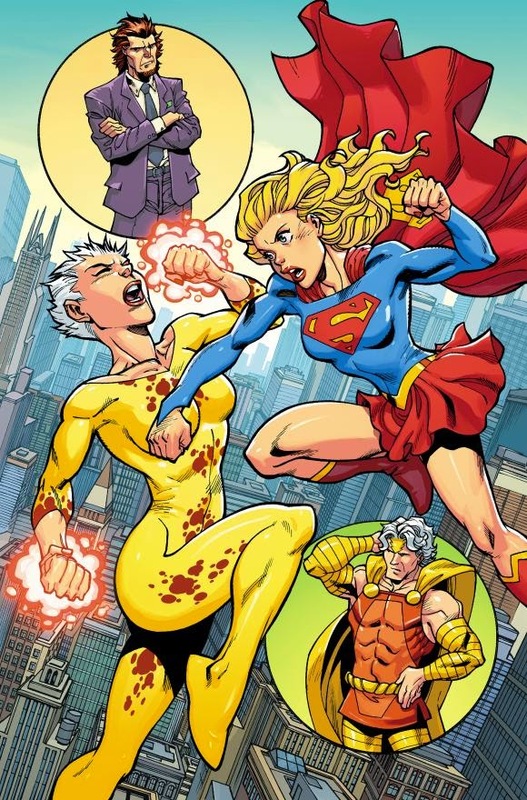 Well, this week, Supergirl #36, written by Perkins and Johnson with art by Emanuela Lupacchino came out. And I have to applaud it for being a great first issue, setting up the new direction of the book while acknowledging and respecting what came before. 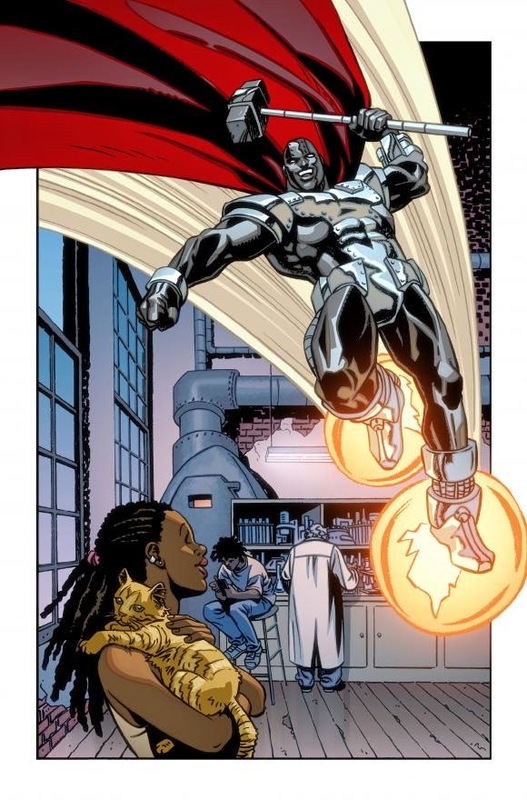 In that way it is akin to the setup for Daring New Adventures of Supergirl that we saw in Superman #376 and saw in Supergirl #34 by Sterling Gates and Jamal Igle. That is high praise. It starts out with a great majestic picture of Supergirl flying in the sunlight, determined look on her face, cape billowing. It is a beautiful panel. But the words are as important. "The past is the hardest thing to escape from." From the first line, we know that this team isn't going to ignore the troubling past of this incarnation of Supergirl. She can't escape what has happened before in her continuity. Like I did with Sterling Gates, I applaud the team for acknowledging that there are some skeletons in the closet here. We'll be dealing with the history of this Supergirl, warts and all. But then things get even better. This image is Kara lost in thought. 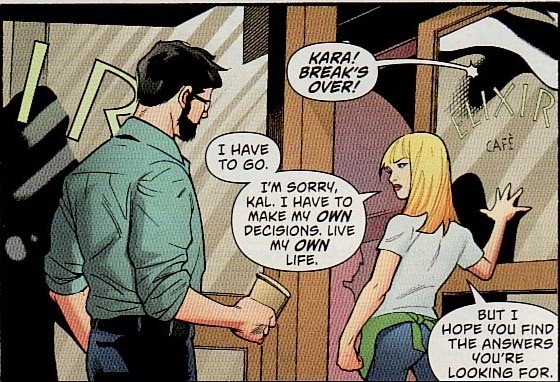 That 'let go' is Kara's boss at a coffeehouse yelling at her to let go of the cappuchino steamer. We are brought back to reality where Kara is a flustered and pestered barista! And just like that we know that Kara has finally embraced Earth as her home. I mean, she is getting yelled at while working a blue collar job ... and accepting it! This is a far cry from the girl who wanted to be alone in her Sanctuary at the bottom of the ocean! In one page I got two things that were important to me. One, we acknowledge the past. This was no hard reboot. And two, we are moving away from the rough earlier characterization and are building on Tony Bedard's foundation. Now my absolute favorite part of this issue is a scene where Kara and Clark have a heart-to-heart conversation, talking about both the past and the future. It is, by no means, warm and fuzzy. But it feels like the way family sometimes talk to each other. And it amazes me that Kara comes off as the more mature one here, trying to shake Superman from the post-Doomed doldrums. And Kara standing up to Superman for trying to get her to not act or use her powers is fantastic. 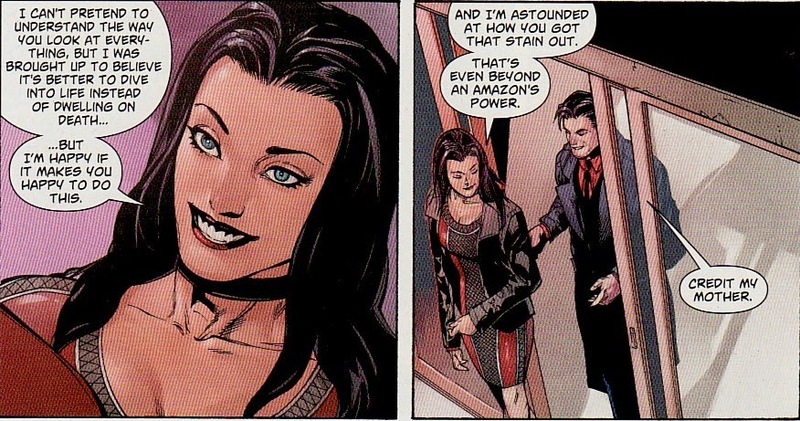 I love how she throws Super-Doom up to him when he comments on her turn as a Red Lantern. He did way more damage than Kara did in Red Daughter. In fact, she was her most heroic in that arc. There was also a whiff of Silver Age here when Kal tried to hold Supergirl back until she 'learned her powers'. This isn't the 50s. She isn't going to tolerate that. And it is so awesome that Kal is the one who no longer wants to act while Kara is the one who wants to protect people and live among the people! This thin panel, with those piercing eyes is perfect. How could Superman forget that it is a NEVER-ENDING battle?? And to hear Kara say she wants to embrace a 'normal life' on Earth. Hurrah! Bedard set this up. But this is cementing it! And the ending of this scene really reminded me of Superman #376. Sure, she is part of the Super-family. But Supergirl has to live her own life, make her own decisions, and not blindly listen to Kal, especially when he is trying to make her take steps backwards. Sure, they aren't hugging. But there is respect and I would say some love between them, even if they don't agree. As I have said before, even within this review, one of the things I was looking for in this new direction was for it to build on the plots that have gone before, both the good and the bad. So I had to show this panel where Kara hears (from across the city) Siobhan playing a song. Siobhan was one of the best parts of this book. To see Kara recognize that she has wronged Siobhan by pushing her away, is wonderful. The Banshee needs to be part of this book. But I hope it is as a friend and not an enemy. The quiet walk home ends abruptly when Supergirl is transported away, to alien worlds and environments, where she has to battle opponents to prove how 'worthy' she is. These are pretty straightforward action sequences where Supergirl prevails over all. I had to showcase this fight just because the new Maxima looks great. 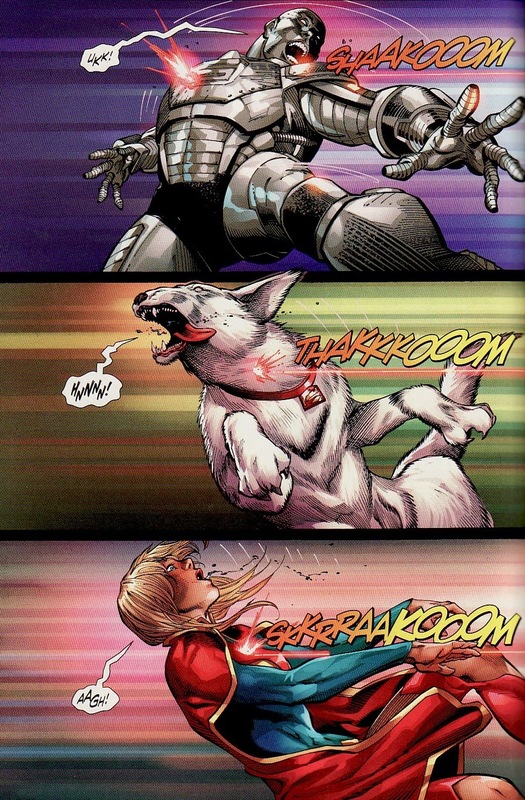 Kara also defeats a cat-man named Tsavo and Captain Comet. These 'fights' were recruiting battles to see if Kara was worthy of Crucible. We knew all about this before the issue given the publicity. But it is great to finally hear about it from the characters. This does sound a bit like the Warrior school on Okaara in a prior DC Universe. Supergirl will learn to better her skills to better defend her world. I do wonder if Superman's sudden lack of interest in heroing as well as Supergirl deciding to have a life on Earth and protect people might be the impetus for Kara to agree to come here. Maybe she feels that she needs to insert herself into Superman's role if he continues this 'retirement'. As if that wasn't enough, Perkins and Johnson throw in a delicious wrinkle. Shay Veritas was a student at Crucible! Now that is a great little hook. Maybe we will learn more about Shay, her origins, and what she did here. And then, if all this great characterization wasn't enough, we get a killer cliffhanger. Kon-El didn't sacrifice himself in Krypton Returns. He is trying to lead a quiet life until he figures things out. He is living as a monk! Phenomenal. Remember, I had problems with the narcissistic bank-robbing Kon. And I didn't like the angry weapon Kon. This is a big step forward for the character. One that makes sense. This issue is 2 days old and I already want to read more. So congratulations to this new creative team. Thanks for accepting the past, making Supergirl great and heroic, and moving things forward! I couldn't ask for more from a 'bold new direction'.